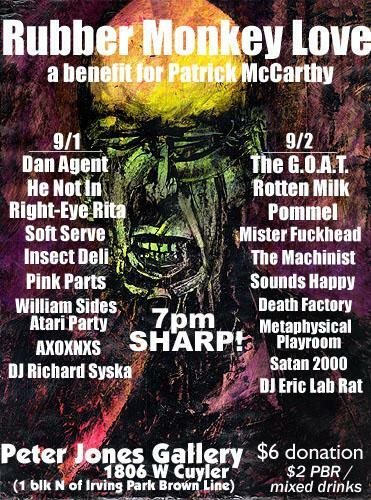 For those who feel like sharing the Love with Patrick of Rubber Monkey and friends, check out the benefit concert/circuit bent instrument sale in Chicago tonight and tomorrow (9/1/2006 and 9/2/2006) at the Peter Jones Gallery. The GOAT founder Patrick is in not feeling the greatest and his friends decided to throw a benefit to lift his spirits and help out financially! Lots of good Music and Circuit Bent goodness. The GOAT workshops each month are no more, but I am sure someone will take on the responsibility to keep the ball rolling in that area. Hope everyone has a great time.